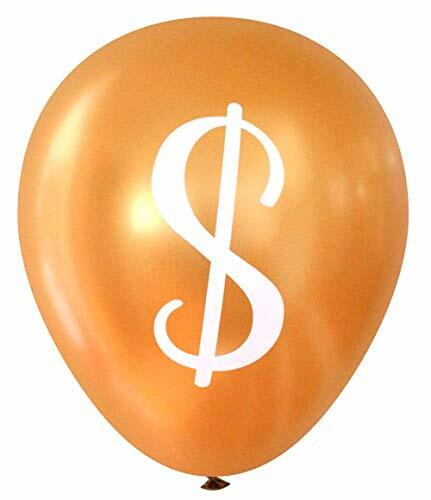 New Money Themed Party Deals. Halloween Store. Incredible selection of Halloween Costumes, Halloween Decorations and more! 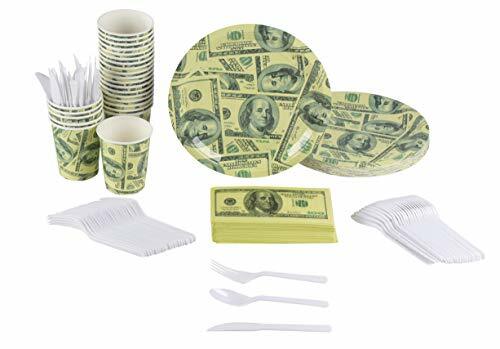 Serve party guests in style with this $100 Hundred Dollar Bill Money Dinnerware Set. This set of disposable party supplies includes 24 paper plates, cups, napkins, knives, forks, and spoons. Perfect for any occasion including dinner parties, tea parties, Christmas and New Years celebrations. This disposable tableware is made of recyclable materials which are durable enough to handle heavy, messy party food. Helps conserve water by eliminating the need to do the dishes while reducing the risk of breaking glass and plates. Beistle 57737 100 Bill Pennant Banner. This is a decorative pennant banner featuring the 100 bill as pennants. It is made of an all-weather plastic material and has 12 pennants on the string. The banner measures 10 Inch tall by 12 feet wide and is perfect for any casino themed or money related party. Beistle 50823 "Dollar" Gleam 'N Burst Centerpiece. 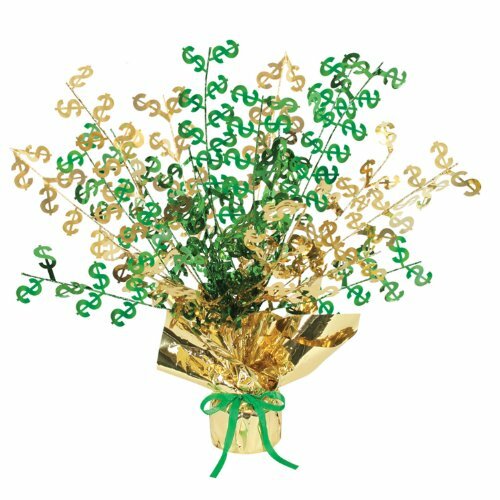 This "Dollar" metallic Gleam 'N Burst centerpiece features green and gold "Dollar" icons on wire stems. It has a gold metallic base that is weighted. The centerpiece measures 15 Inch tall and is a fantastic centerpiece for any casino themed or money related party!. 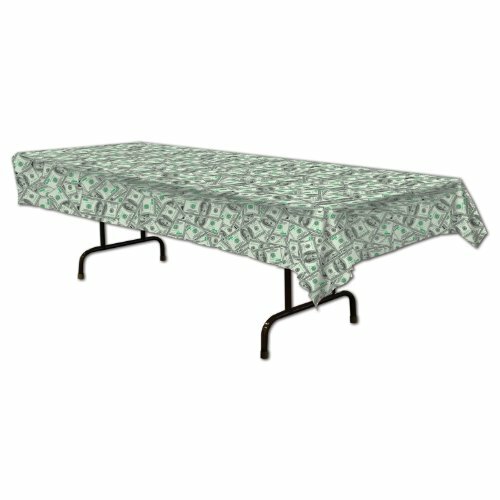 Big Bucks Tablecover, Measures, 54-Inch by one hundred eight-Inch, plastic tablecover, great for an event and great for decorating, Great for a casino event. Beistle S55454GDAZ4 foil "$" Silhouette. 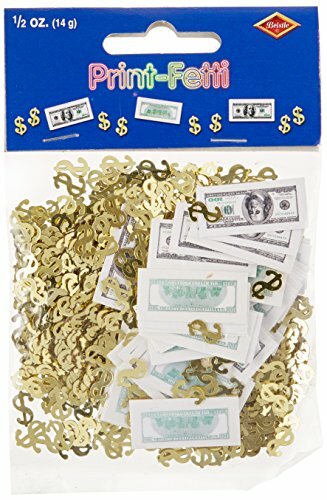 The package contains 4 dollar Sign silhouettes. The silhouettes measure 16" tall by 8" wide. They are printed on both sides of foil-covered board stock paper. 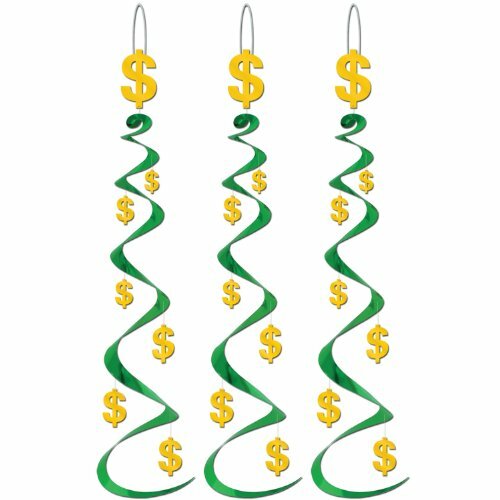 They are a wonderful decoration to hang at your next casino themed or money related party or event! Beistle 50610 Big Bucks Print-Fetti. 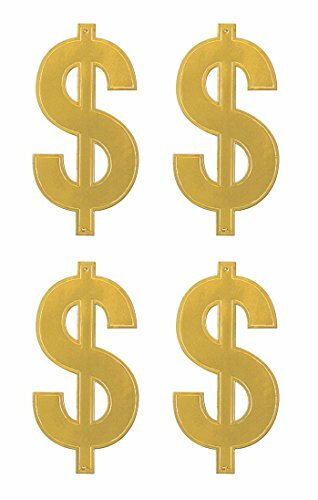 This print-fetti features printed 100 dollar bills with numerous gold metallic "Dollar" signs. These would be a great addition for any casino themed or money related party. There is a half ounce of confetti in the package.